Dr. Bradley K. Yoder (b. 1966), Professor , completed his undergraduate studies in biochemistry and molecular biology at the University of Maryland Baltimore County (B.S. 1988), and received a Ph.D. in molecular and cellular biology from the University of Maryland in 1993. His postdoctoral studies were performed at Oak Ridge National Laboratory under the guidance of Dr. Rick Woychik where Dr. Yoder was an Alexander Hollaender Distinguished Postdoctoral Fellow. 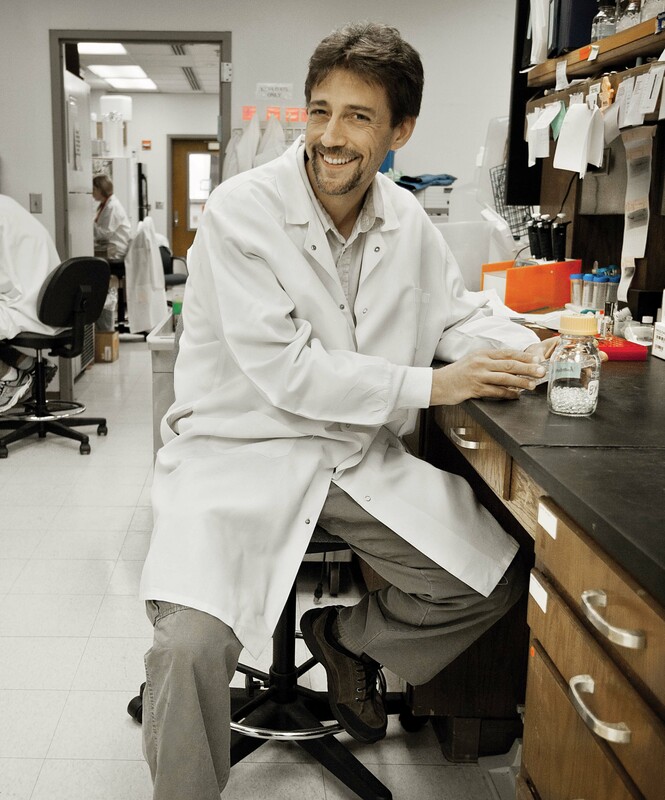 His research over the past two decades has focused on the cellular and molecular mechanisms regulating assembly, maintenance, and function of the primary cilium utilizing complementary approaches in mice, C. elegans, and in cell culture models. Work from his laboratory has utilized genetic screens in C. elegans to identify proteins required for ciliogenesis and cilia mediated signaling activities and how these genes function in pathways (e.g. Daf-2 Insulin/IGF-like pathway) that regulate life span and energy homeostasis. His group has analyzed in mammalian systems how the cilium regulates important developmental pathways and how loss of the cilium causes abnormalities in left-right body axis specification, limb and tooth patterning, skin and hair follicle morphogenesis, and impairs endochondrial bone formation. His group is also providing important fundamental insights into the connection between ciliary dysfunction and cystic kidney disorders, and novel roles for neuronal cilia in the regulation of satiation responses, disruption of which causes obesity and type II diabetes. Cilia come in both motile and immotile forms. While motile cilia were known to have important roles in the lung and respiratory system, primary cilia were largely considered vestigial structures. A major paradigm shift in the field occurred with the generation of mouse mutants (such as the orpk mouse) that disrupt cilia formation. These new mouse mutants revealed important and novel roles for motile and immotile cilia and demonstrated that they are essential for development and tissue function. Defects in cilia have been implicated as the cause of a large and rapidly expanding group of human syndromes (Ciliopathies) with a wide range of developmental and disease phenotypes. The objectives of my research program are to uncover mechanisms regulating assembly, maintenance, and functions of both motile and primary forms of cilia and to determine how defects in these processes contribute to developmental abnormalities and disease pathogenesis. To accomplish these goals, my group utilizes complementary cell, genetic, and biochemical approaches in mice, C. elegans, and cell culture to identify new proteins involved in ciliogenesis and cilia mediated signaling. Work from my group has identified novel components of the ciliary transition zone, an important domain controlling what protein enter or are retained in the cilium. We have provided seminal insights into how the cilium regulates developmental pathways, such as hedgehog, and how alterations in cilia-mediated regulation of this pathway cause polydactyly, defects in endochondral bone formation, and abnormal skin and hair follicle morphogenesis. My group made fundamental contributions that connected ciliary dysfunction to the formation of cysts in the kidney, liver, and pancreas, and uncovered a new role for cilia on hypothalamic neurons in regulating satiation responses. We have shown that disruption of cilia on these neurons cause morbid obesity and type II diabetes. We also identified genes important in regulating ciliary motility and waveform and determined that their loss in mice leads to hydrocephalus, bronchiectasis, and randomization of the left-right body axis. Importantly, as part of this work we determined that a mutation of one of these genes we identified in our mouse model is responsible for a form of primary ciliary dyskinesia (PCD) in humans. As in the mouse model, these human PCD patients frequently have left-right body situs defects. In summary, the research conducted by my group is providing important and innovative insights into how cilia are constructed and how they are established as a unique signaling and sensory organelle with a distinct protein composition the rest of the cell membrane. We have uncovered many diverse and unexpected roles for cilia during development and in maintaining mammalian health. Bradley K. Yoder*, Noel S. Murcia*, William G. Richards*, Michael L. Mucenski, John R. Dunlap and Richard P. Woychik. The Oak Ridge Polycystic Kidney (orpk) disease gene is required for left-right axis determination. * These authors contributed equally to this manuscript. Development 127: 2347-2355 (2000). BK Yoder. Role of primary cilia in the pathogenesis of polycystic kidney disease. J Am Soc Nephrol. May;18(5):1381-8. [Epub ahead of print ] (2007). B Song, CJ Haycraft, HS Seo, BK Yoder, and R Serra. Development of the post-natal growth plate requires intraflagellar transport proteins. Dev Biol. May 1;305(1):202-16. [Epub ahead of print] (2007). G Ou, M Koga, OE Blacque, T Murayama, Y Ohshima, JC Schafer, C Li, BK Yoder, MR Leroux, and JM Scholey. Sensory Ciliogenesis in Caenorhabditis elegans: Assignment of IFT components into Distinct Modules Based on Transport and Phenotypic Profiles. Mol Biol Cell. Feb 21; [Epub ahead of print] (2007). Courtney J. Haycraft, Qihong Zhang, Buer Song, Walker S. Jackson, Peter J. Detloff, Rosa Serra, and Bradley K. Yoder. Intraflagellar Transport is Essential for Endochondral Bone Formation. Development, 134(2):307-16 (2007). JC Schafer, ME. Winkelbauer, CL. Williams, CJ. Haycraft, RA. Desmond, BK. Yoder. IFTA-2 is a conserved cilia protein involved in pathways regulating longevity and dauer formation in C. elegans Journal of Cell Science 119(19):4088 -4100 (2006). E Efimenko, OE Blacque, G Ou, CJ Haycraft, BK. Yoder, JM. Scholey , MR. Leroux and P Swoboda C. elegans DYF-2, an ortholog of human WDR19, is a component of the IFT machinery in sensory cilia Molecular Biology of the Cell 17(11):4801-4811 (2006). BK Yoder. More than just the postal service: novel roles for IFT proteins in signal transduction. Dev Cell. May;10 (5):541-542 (2006). Nicolas F. Berbari, Nicholas W. Kin, Neeraj Sharma, Edward J. Michaud, Robert A. Kesterson, and Bradley K. Yoder. Mutations in Traf3ip1 reveal defects in ciliogenesis, embryonic development, and altered cell size regulation. Developmental Biology (in press 2011). Cilia, cystic kidney diseases, obesity, signal transduction, cell fate determination and embryonic patterning, birth defects, mouse and C. elegans models.